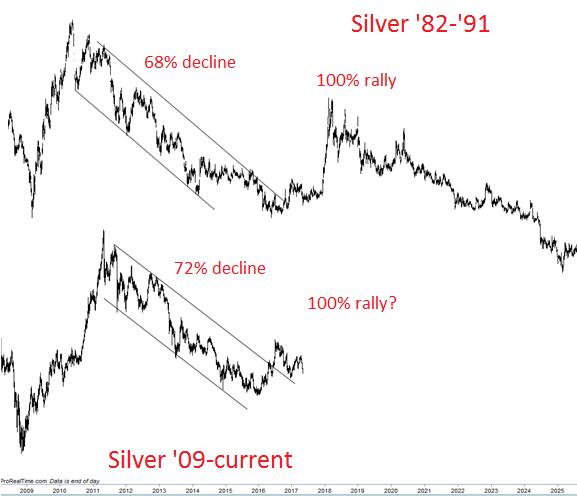 A look at the trends - or lack of them - in silver. How to approach the recent sell-off and weakness compared to gold. 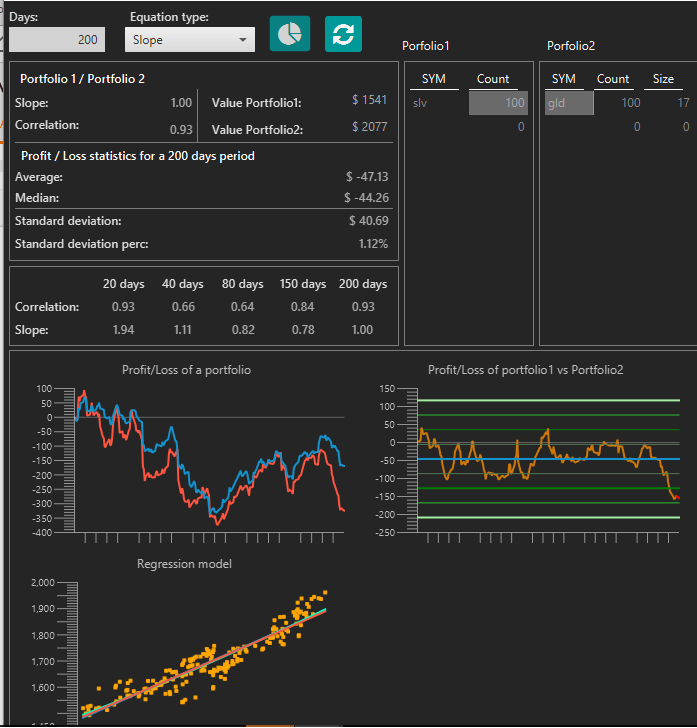 Tailoring trading strategies to suit each time frame. Last week, I wrote an article on gold (NYSEARCA:GLD) trends, from the very longest time frame, right down to the short term. In this article, I will do the same for silver (NYSEARCA:SLV). Each time frame has its own trend or characteristic and these are important for setting context and objectives for our trades. We may catch a 100% rally, but our time frame determines if we bank those gains or let them dwindle away to zero again. The software adjusts position sizes for beta in two separate portfolios. This gives a correlation of 0.93 over 200 days, which tells us that they have similar returns over the medium to long term. 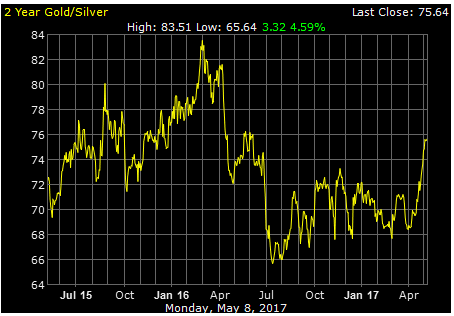 But you can also see in the middle left chart how recently the silver position (in red) has fallen much more than gold (in blue). In fact, the middle right chart shows us that the normal relation is stretched to an unusual 3 standard deviations. The very recent spike higher again tells us gold gained in strength compared to silver. But because we don't know if this will continue, or how the spread will narrow again (either gold weakens or silver strengthens), the only way to use this information is to create a statistical arbitrage. If we short gold and long silver in beta adjusted positions - as shown in the software in the first chart - we can be independent of the way precious metals move and only trade the narrowing of the spread. There is still some risk with this approach. Silver's volatility could increase even more and any further declines would not necessarily be covered 1:1 by the short gold position. And the rewards aren't huge; a move of 3 standard deviations back to mean in both positions is only 3.36%. So perhaps the recent divergence isn't creating the greatest trade opportunity, but it does create important differences in the cycles. 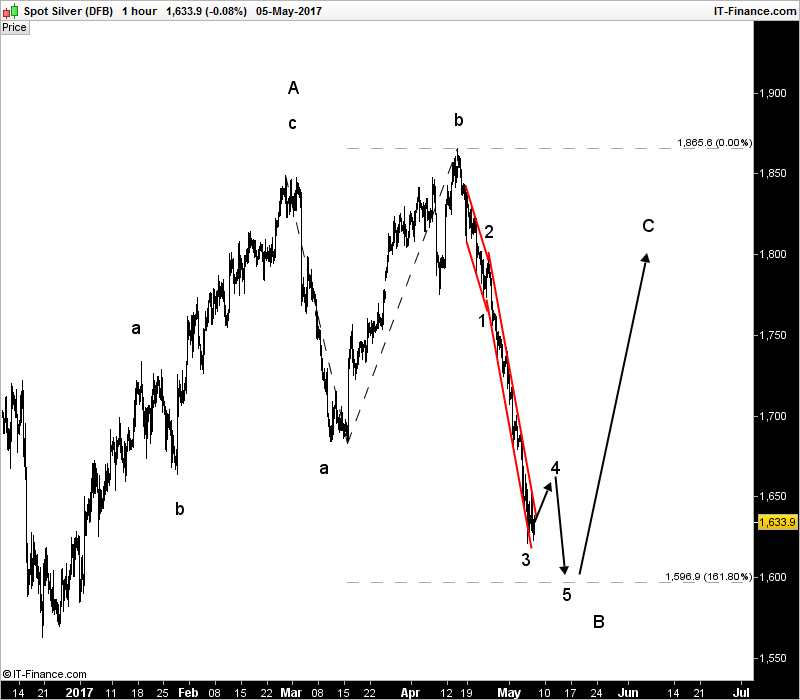 I track these cycles using Elliott Wave, which is a function of positioning and sentiment. As we shall see below, slight variations in the gold and silver moves can have profound effects on trends over the longer term, even though the correlation is so consistently high. 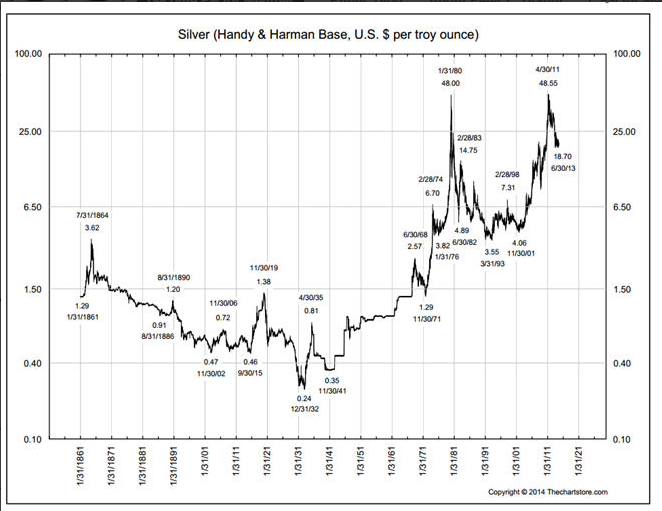 None of silver's Elliott Wave counts are the same as gold. In this 150-year chart of silver, we can see the very long-term trend is clearly higher. The rally in 2011 into the old $50 high from 1980 was too parabolic and overbought to sustain any break. A pullback is healthy and sets up the break at a later time. This is reflected in the very large 'cup and handle pattern' on the chart, with the 2011-present correction establishing the 'handle'. If and when silver approaches $50 again, and consolidates below, then we can be confident of a break. With price pulling back in a very long-term uptrend, the long-term question is where will the decline end? On some shorter time frames, the trend from 2011 looks bearish, but this long-term (monthly) logarithmic chart shows a more bullish picture. Prices found support on the 200-month moving average and broke the downtrend channel. This doesn't necessarily mean prices have bottomed - in time another decline could form and make a brief new low - but it does mean in the medium term, prices should stabilize and move higher to retrace the first decline. Once a downtrend channel breaks, the expectation is for higher prices. How high and by what path are somewhat of an educated guess, and to help with this, I look for historical examples and logical areas to test. Historical examples are particularly useful as they show what has happened under comparative positioning and sentiment. They carry no bias. The chart below shows one such example. When the downtrend from 1982-1986 broke, prices moved sideways until 1987 before spiking higher in a 100% rally. 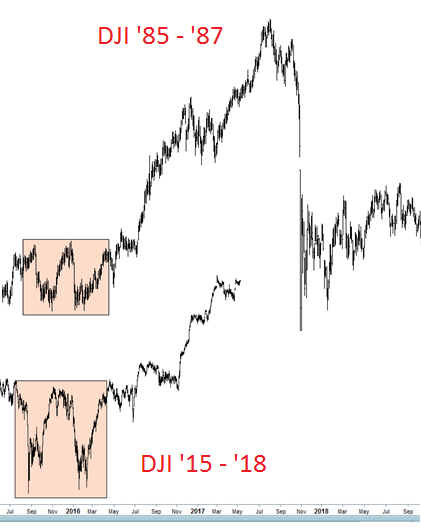 This was actually 6 months prior to the crash in equities, so they were unrelated, but it's still interesting the structure of the current Dow Jones (NYSEARCA:DIA) rally has similarities to this period. 1987 had been a strong year for the stock market leading up to the crash, as it continued the bull market that began in 1982. However, there were some warning signs of excesses that were similar to excesses at previous inflection points. Economic growth had slowed while inflation was rearing its head. There were also some geopolitical issues related to currency disputes between the United States and Germany [China in present day]. The strong dollar was putting pressure on U.S. exports. The stock market and economy were diverging for the first time in the bull market. Due to this factor, valuation for the stock market climbed to excessive levels, with the price to earnings ratio climbing above 20. Silver and equities don't have much of a correlation, but some of the same conditions which caused silver to spike higher followed by an equity crash in 1987 are present today. And as the drivers and price structure on the charts are comparable, the outcomes may be too. 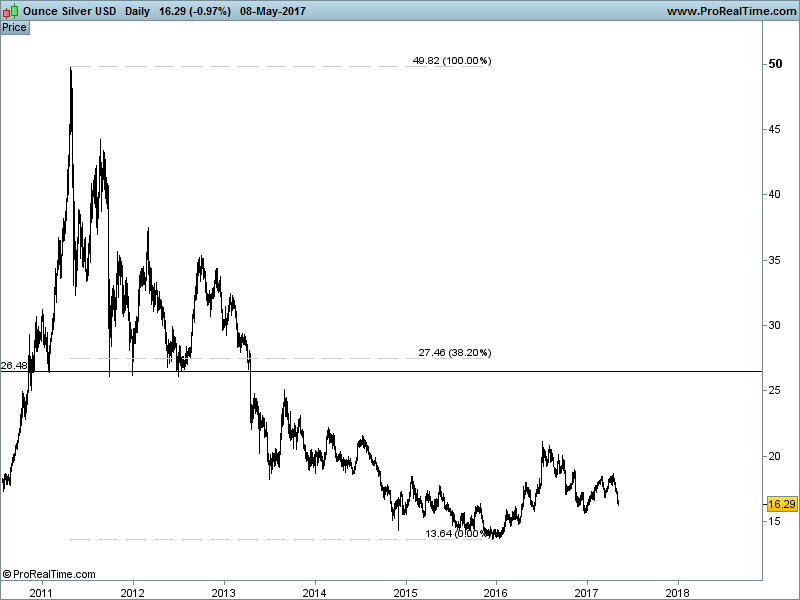 If silver were to rally 100% from the $13.64 low, it would target $27. This is a logical area to test, as it is where silver broke down from a two-year consolidation top and is also the 38.2% Fibonacci retracement of the 2011 decline. 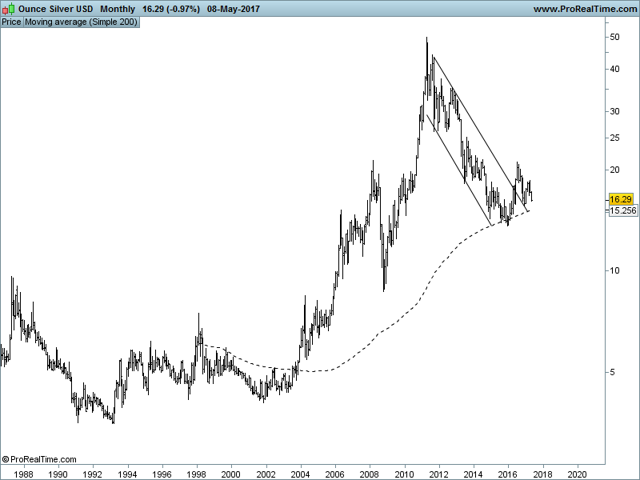 In the medium term, the trend may be sideways and unclear, but it seems silver is setting up for a significant spike higher which will eventually fade. The short-term moves seem little more than a series of stop runs, with the move over $18.5 in April taking short stops, and the move below the March low doing the opposite. Actually, one of those stops was mine as I tried to buy near the March lows. I will try again at $15.9, this time with a much wider stop as I strongly believe the current decline is near an end, and the short- to medium-term path is higher. This chart is from my weekend update. Although we can discount much of the short-term price action as 'noise', noise can be quite painful if your position size is too large. There well may be a short-term move back to $18 and another decline, but the moves in these time frames are hard to call. I plan on holding a smaller position for any move towards the $27 medium-term target. Very long term - the trend is up. Hold. Long term - the trend is consolidating sideways to down in order to set up a break of $50. Hold or wait to buy. Medium term - the trend is mixed, but is setting up a spike to $27 in the next 12 months. Look for longs, but size appropriately so positions can ride out the short-term moves. Short term - the trend is sideways with unsustained spikes/stop runs in either direction. The next short-term move should be higher from just under $16 towards $18 again. Disclosure: I am/we are long GLD. I wrote this article myself, and it expresses my own opinions. I am not receiving compensation for it (other than from Seeking Alpha). I have no business relationship with any company whose stock is mentioned in this article.